Auer, Anita, Denis Renevey, Camille Marshall & Tino Oudesluijs (eds.). 2019. Revisiting the Medieval North of England: Interdisciplinary Approaches. Cardiff: University of Wales Press. Kasstan, Jonathan Richard, Anita Auer & Joe Salmons (eds.). 2018. Special Issue on ‘Heritage-Language Speakers: Theoretical and Empirical Challenges on Sociolinguistic Attitudes and Prestige’, International Journal of Bilingualism 22(4). Säily, Tanja, Arja Nurmi, Minna Palander-Collin & Anita Auer (eds.). 2017. Exploring Future Paths for Historical Sociolinguistics. (Series: Advances in Historical Sociolinguistics). Amsterdam: John Benjamins. Auer, Anita, Catharina Peersman, Simon Pickl, Gijsbert Rutten & Rik Vosters (eds.). 2015 – 2018. Journal of Historical Sociolinguistics. Volumes 1 (1, 2), 2 (1, 2) and 3 (1, 2). Berlin & New York: De Gruyter Mouton. NEW JOURNAL IN 2015 – first 2 issues OPEN ACCESS! Auer, Anita, Victorina González-Díaz, Jane Hodson & Violeta Sotirova (eds.). 2016. Linguistics and Literary History. In Honour of Sylvia Adamson. Amsterdam: John Benjamins. Auer, Anita & Björn Köhnlein (eds.). 2014. Linguistics in the Netherlands 31 (2014). Amsterdam: John Benjamins. Aalberse, Suzanne & Anita Auer (eds.). 2013. Linguistics in the Netherlands 30 (2013). Amsterdam: John Benjamins. Auer, Anita. 2009. The Subjunctive in the Age of Prescriptivism: English and German Developments in the Eighteenth Century. (Series: Palgrave Studies in Language History and Language Change). Basingstoke: Palgrave Macmillan. 240 pages. Auer, Anita. in prep. Writing across the Social Spectrum. Letter Writing Practices in Nineteenth-century Northern England. (Series: Language and Social Processes). Berlin/New York: Mouton de Gruyter. Auer, Anita. Forthcoming. Die Stadtsprache Yorks im späten Mittelalter. Ein Baustein zu einer alternativen Standardisierungsgeschichte des Englischen. In Simon Pickl & Stephan Elspaß (eds. ), Historische Soziolinguistik der Stadtsprachen. Kontakt – Variation – Wandel. Heidelberg: Winter (Germanistische Bibliothek). Auer, Anita & Mikko Laitinen. Forthcoming. Mobility, Variability and Changing Literacies in Modern Times. Special Issue of Neuphilologische Mitteilungen. Auer, Anita. 2019. Linguistic Regionalism in the York Corpus Christi Plays. In Anita, Auer, Denis Renevey, Camille Marshall & Tino Oudesluijs (eds. ), Revisiting the Medieval North: Interdisciplinary Approaches, pp. 111-122. Cardiff: University of Wales Press. Auer, Anita, Denis Renevey, Camille Marshall & Tino Oudesluijs. 2019. Setting the Scene: Interdisciplinary Perspectives on the Medieval North of England. In Anita, Auer, Denis Renevey, Camille Marshall & Tino Oudesluijs (eds. ), Revisiting the Medieval North: Interdisciplinary Approaches, pp. 1-12. Cardiff: University of Wales Press. Auer, Anita. 2018. Jane Austen’s Sensitivity to the Subjunctive as a Social Shibboleth. In Margaret Tudeau-Clayton & Martin Hilpert (eds. 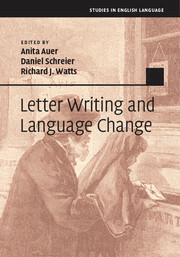 ), The Challenge of Change (Swiss Papers in English Language and Literature (SPELL), Vol. 36), pp. 153-174. Tübingen: Narr. Kasstan, Jonathan Richard, Anita Auer & Joe Salmons (eds.). 2018. Preface to the Special Issue ‘Heritage-Language Speakers: Theoretical and Empirical Challenges on Sociolinguistic Attitudes and Prestige’, International Journal of Bilingualism 22(4). Auer, Anita. 2018. Urban Literacies and Processes of Supralocalisation: A Historical Sociolinguistic Perspective. In Natalie Braber & Sandra Jansen (eds.) Sociolinguistics in England, pp. 13-34. London: Palgrave Macmillan. Tanja Säily, Arja Nurmi, Minna Palander-Collin & Anita Auer. 2017. The Future of Historical Sociolinguistics? In Tanja Säily, Arja Nurmi, Minna Palander-Collin & Anita Auer (eds. ), Exploring Future Paths for Historical Sociolinguistics. (Series: Advances in Historical Sociolinguistics), pp. 1-19. Amsterdam: John Benjamins. Auer, Anita, Victorina González-Díaz, Jane Hodson & Violeta Sotirova. 2016. Introduction. In Anita Auer, Victorina González-Díaz, Jane Hodson & Violeta Sotirova (eds. ), Linguistics and Literary History. In Honour of Sylvia Adamson, pp. 1-12. Amsterdam: John Benjamins. Auer, Anita. 2016. Chapter 2. The Origin and Development of the iffy-an(d) Conjunction. In Anita Auer, Victorina González-Díaz, Jane Hodson & Violeta Sotirova (eds. ), Linguistics and Literary History. In Honour of Sylvia Adamson, pp. 31-48. Amsterdam: John Benjamins. Auer, Anita, Moragh Gordon & Mike Olson. 2016. English Urban Vernaculars, 1400-1700: Digitizing Text from Manuscript. In María José López-Couso, Belén Méndez-Naya, Paloma Núñez-Pertejo & Ignacio Palacios-Martínez (eds. ), Corpus linguistics on the move: Exploring and understanding English through corpora (Language and Computers Series 79), pp. 21-40. Amsterdam: Brill/Rodopi. Auer, Anita, Catharina Peersman, Simon Pickl, Gijsbert Rutten & Rik Vosters. 2015. Historical Sociolinguistics: the Field and its Future. Journal of Historical Sociolinguistics Volume 1(1): 1–12. Auer, Anita & Marcel Withoos. 2015. Social Stratification and Stylistic Choices in Thomas Dekker’s The Shoemaker’s Holiday (1600). In Dirk Delabastita & Ton Hoenselaars (eds. ), Multilingualism in the Drama of Shakespeare and His Contemporaries (Benjamins Current Topics), pp. 137-160. Amsterdam: John Benjamins. Auer, Anita. 2015. Stylistic Variation in Modern English Letters. In Anita Auer, Daniel Schreier & Richard J. Watts (eds. ), Letter Writing and Language Change. Cambridge: Cambridge University Press. Auer, Anita, Daniel Schreier & Richard J. Watts. 2015. Epilogue: Where next?. In Anita Auer, Daniel Schreier & Richard J. Watts (eds. ), Letter Writing and Language Change. Cambridge: Cambridge University Press. Auer, Anita. 2014. Nineteenth-century English: Norms and usage. In Gijsbert Rutten, Rik Vosters & Wim Vandenbussche (eds. ), Norms and Usage in Language History, 1600–1900. A Sociolinguistic and Comparative Perspective, pp. 151-170. Amsterdam: John Benjamins. Auer, Anita. 2014. Let’s not, Let’s don’t and Don’t let’s in British and American English. In Marianne Hundt (ed. ), The Syntax of Late Modern English, pp. 38-55. Cambridge: Cambridge University Press. Auer, Anita, Mikko Laitinen, Moragh Gordon & Tony Fairman. 2014. An Electronic Corpus of Letters of Artisans and the Labouring Poor (England, c. 1750-1835): Compilation Principles and Coding Conventions. In Lieven Vandelanotte, Kristin Davidse, Caroline Gentens & Ditte Kemps (eds. ), Recent Advances in Corpus Linguistics. Developing and Exploiting Corpora, pp. 9-29. Amsterdam/New York: Rodopi. Laitinen, Mikko & Anita Auer. 2014. Letters of Artisans and the Labouring Poor (England, c. 1750-1835). Approaching Linguistic Diversity in Late Modern English. In Simone E. Pfenninger, Olga Timofeeva, Anne-Christine Gardner, Alpo Honkapohja, Marianne Hundt & Daniel Schreier (eds. ), Contact, Variation and Change in the History of English, pp. 187-212. Amsterdam: John Benjamins. Auer, Anita & Tony Fairman. 2013. Letters of Artisans and the Labouring Poor (England, c. 1750-1835). In Paul Bennett, Martin Durrell, Silke Scheible & Richard Jason Whitt (eds. ), New Methods in Historical Corpora, pp. 77-91. Tübingen: Narr Verlag. Auer, Anita & Marcel Withoos. 2013. Social Stratification and Stylistic Choices in Thomas Dekker’s The Shoemaker’s Holiday (1600). In Dirk Delabastita & Ton Hoenselaars (eds. ), Multilingualism in the Drama of Shakespeare and His Contemporaries (Special Issue English Text Construction 6.1), pp. 134-157. Amsterdam: John Benjamins. Auer, Anita. 2012. Late Modern English Standardization. In Laurel Brinton & Alexander Bergs (eds. ), Historical Linguistics of English: An International Handbook, pp. 939-951. New York: Mouton de Gruyter. Auer, Anita & Anja Voeste. 2012. Linguistic and Socio-Demographic Variables: Grammatical Variables. In Juan Manuel Hernández-Campoy & Juan Camillo Conde-Silvestre (eds. ), The Handbook of Historical Sociolinguistics, pp. 253-270. Malden, MA. : Blackwell. Auer, Anita. 2008. Eighteenth-Century Grammars and Book Catalogues. In Ingrid Tieken-Boon van Ostade (ed. ), Grammars, Grammarians, and Grammar Writing in Eighteenth-Century England, pp. 57-75. Berlin/New York: Mouton de Gruyter. Auer, Anita. 2008. The Letter wihch that I Wrote – Self-Corrections in LModE Letters. In Marina Dossena & Ingrid Tieken-Boon van Ostade (eds. ), Studies in Late Modern English Correspondence: Methodology and Data, pp. 213-234. Bern: Lang. Auer, Anita. 2008. Lest the Situation Deteriorates – A Study of Lest as Trigger of the Inflectional Subjunctive. In Miriam A. Locher & Jürg Strässler (eds. ), Standards and Norms in the English Language, pp. 149-173. Berlin; New York: Mouton de Gruyter. Auer, Anita. 2008. The Inflectional Subjunctive in Selected Works of Shakespeare – A Socio-Stylistic Analysis. In Henk Aertsen & Bart Veldhoen (eds. ), The Proceedings of the 28th Symposium on Medieval Studies, pp. 39-49. Leiden. Auer, Anita & Ingrid Tieken-Boon van Ostade. 2007. Robert Lowth and the Use of the Inflectional Subjunctive in Eighteenth-Century English. In Ute Smit, Stefan Dollinger, Julia Hüttner, Ursula Lutzky & Gunther Kaltenböck (eds. ), Tracing English through Time: Explorations in Language Variation, pp. 1-18. Vienna: Braumüller. Auer, Anita. 2007. Österreichisches Deutsch ist eine würde-volle Sprache – The Subjunctive Mood in Eighteenth-Century Austria. Leiden Working Papers in Linguistics 4/1: 1-20. Auer, Anita. 2006. Precept and Practice: The Influence of Prescriptivism on the English Subjunctive. In Christiane Dalton-Puffer, Dieter Kastovsky, Nikolaus Ritt & Herbert Schendl (eds. ), Syntax, Style and Grammatical Norms: English from 1500-2000, pp. 33-53. Frankfurt: Peter Lang. Auer, Anita & Victorina González-Díaz. 2005. Eighteenth-Century Prescriptivism in English: A Re-evaluation of its Effects on Actual Language Usage. Multilingua 24(4): 317-341. Auer, Anita. 2004. The Treatment of the Subjunctive in Eighteenth-century Grammars of English. Paradigm 2/8 (October 2004): 3-18. Auer, Anita. 2017. History of English Linguistics. The Year’s Work in English Studies (2015). Oxford: Oxford University Press. Auer, Anita. 2016. History of English Linguistics. The Year’s Work in English Studies (2014). Oxford: Oxford University Press. Auer, Anita. 2015. History of English Linguistics. The Year’s Work in English Studies (2013). Oxford: Oxford University Press. Auer, Anita. 2014. Review of Robert McCollar Millar (2012), English Historical Sociolinguistics. Edinburgh University Press. English Studies 2014. Auer, Anita. 2014. History of English Linguistics. The Year’s Work in English Studies (2012). Oxford: Oxford University Press. Auer, Anita. 2013. History of English Linguistics. The Year’s Work in English Studies (2011). Oxford: Oxford University Press. Auer, Anita. 2012. History of English Linguistics. The Year’s Work in English Studies (2010). Oxford: Oxford University Press. Auer, Anita. 2011. History of English Linguistics. The Year’s Work in English Studies (2009). Oxford: Oxford University Press. Auer, Anita. 2010. History of English Linguistics. The Year’s Work in English Studies (2008). Oxford: Oxford University Press. Auer, Anita. 2009. History of English Linguistics. The Year’s Work in English Studies (2007). Oxford: Oxford University Press. Auer, Anita. 2008. History of English Linguistics. The Year’s Work in English Studies (2006). Oxford: Oxford University Press. Auer, Anita & Jan Claas Freienstein. 2006. Language History from Below – Linguistic Variation in the Germanic Languages from 1700-2000 (University of Bristol, 6 – 8 April 2005) [Conference report]. Zeitschrift für Germanistische Linguistik 34: 461-468.